Most people might not consider fake cigars to be a problem. But when the cost of real Cuban cigars is high, and as the popularity of cigar smoking has risen, so have the number of counterfeits. Although it’s only a rough guide, it’s believed that 80 per cent of so-called Cuban cigars sold are actually fakes. Habanos are the name of both authentic Cuban cigars and the company – run by the Cuban government – that legally distributes them. The company takes the cigars from the factories where they’re made and then sends them out to the authorised dealers in different countries. 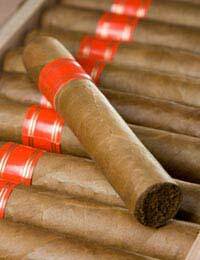 The fake Cuban cigars do also come from Cuba; they just don’t go through legitimate channels. Rather than proper factories, they’re made in homes in back streets. The leaves for the cigars are discards from the proper factories, and the cigar bands and boxes are stolen from there. Those behind the counterfeit business hire couriers to take their product out of the country to be sold abroad. So although they’re fakes, they’re still Cuban cigars in so many ways. They’re just not legal Cuban cigars, the quality doesn’t match up to what the country chooses to export. If you buy a box of cigars that claim to be Cuban, the first thing to do is look at the box. There should be a seal on the left front side of the box, coloured green and white, and containing an insignia. Printed on that should be a hat and a shield. There will also be a sticker on the top right side of the cigar box. It should be white, placed diagonally and printed with the word Habanos. The box itself should be in excellent condition. On the bottom of the box the word Habanos should have been burned into the wood. All too often the counterfeiters won’t take this step, merely using stamps of labels instead. The cigars themselves should have a strong aroma – beware of those that don’t. The wrappers should be tight on the cigar, with no large leaf veins showing. The shape should be uniform and so should the colour, although small golden spots are perfectly normal. For those without much experience it can be very difficult to distinguish a real Cuban cigar from a fake. The best way is to examine the two side by side while being guided by an expert. Even then, unless you smoke several of both kinds, it can prove difficult. The Cuban government is the main force behind fighting the fake cigar trade as it ruins their reputation and their profits. If people don’t find Cuban cigars to be as good as people have always said, they won’t spend money and them. That keeps precious foreign currency out of a very poor country. They know that the routes used for smuggling out the counterfeit cigars are the same as the ones used for the drug trade. As those routes change regularly to confound authorities it’s proving very difficult to stop the trade in fake cigars, especially as there’s so much profit to be made. The government is also imposing greater security at the official factories and at the company. Cigar bands and boxes, not to mention plenty of tobacco leaves, are stolen from there. Anyone caught faces severe penalties. By trying to stop the theft of items that make the contraband they’re working to eliminate the counterfeit trade at the source.